14 videographers covering 22 locations between West Colton and Yermo. 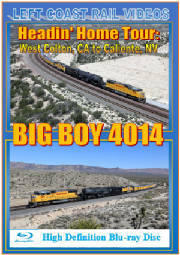 This program covers our chase of Big Boy 4014 on 28 April through 1 May 2014, as well as a brief look during the Pomona to West Colton move on 26 January. Plus aerial footage over the Lower Narrows at Frost and the Upper Narrows at East Victorville. 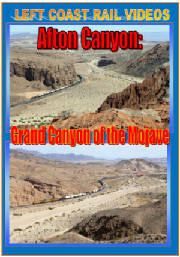 HD Digital video shot in Afton Canyon, CA. during February, March and April 2014. 16 x 9 wide screen viewing format. Available on DVD and high definition Blu-ray disc. 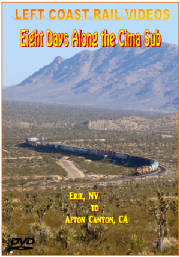 HD Digital video shot along the Union Pacific’s Cima Subdivision from Erie, NV to Afton Canyon, CA. Available on DVD and Hi-Def Blu-ray disc. 16x9 wide screen viewing format.